Encouraging visitors to get hands-on with science, the family-friendly festival will travel to Cowdenbeath Leisure Centre on Saturday 7 and Sunday 8 May and Rothes Halls, Glenrothes on Friday 13 and Saturday 14 May 2016, introducing four free fun and inspirational days for the whole family to enjoy. The programme was unveiled in both venues today by staff from Dundee Science Centre who demonstrated some of the many activities which families can enjoy during the free events. 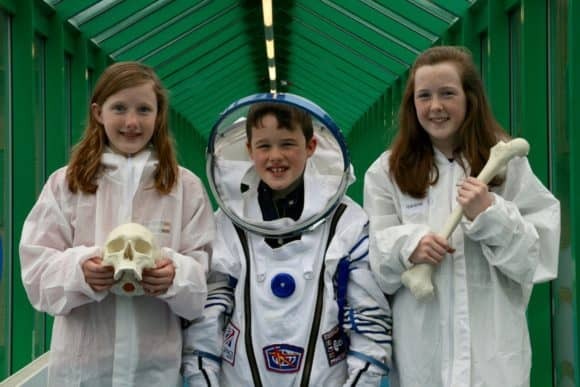 Ever wondered what it’s like to be an astronaut, a firefighter or a CSI investigator? On Saturday 7 May, families and adults can take part in ‘A Day in the Life of…’, an event offering an insight into the skills needed to work in a science, technology or engineering role and a chance to meet industry experts, climb on board a fire engine or try on an astronaut suit. Sunday 8 May will be a ‘Science Celebration’ – an activity-packed day with fun and excitement sure to thrill and entertain the whole family with flashes, experiments, space themed activities and animal handling. Funded by the Scottish Government, Shell UK and Fife Council, the mobile festival will offer a diverse range of free activities for the general public, all coordinated by Dundee Science Centre. Local primary pupils will also have the chance to attend science celebration days in Cowdenbeath and Glenrothes where they will experience exciting hands-on activities featuring levitating trains, computer programming and curious creatures. 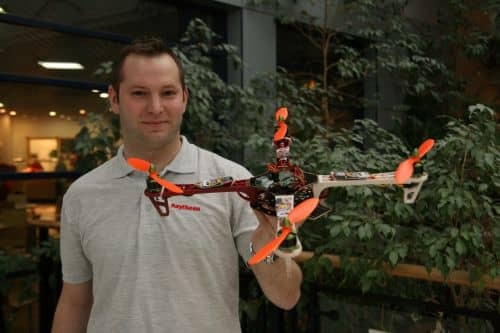 Steve from Raytheon UK with quadcopter! Paul Goodfellow, Upstream Director UK and Ireland, Shell UK added, “As one of the sponsors of the Festival, Shell firmly believe that the way to excite the next generation of engineers and scientists is to encourage young people to have a go at fun, hands-on STEM activities and experiments. For more information, please contact Laura Louch, Festivals and Development Manager, Dundee Science Centre on 01382 228800 or visit www.fifesciencefestival.org.uk.